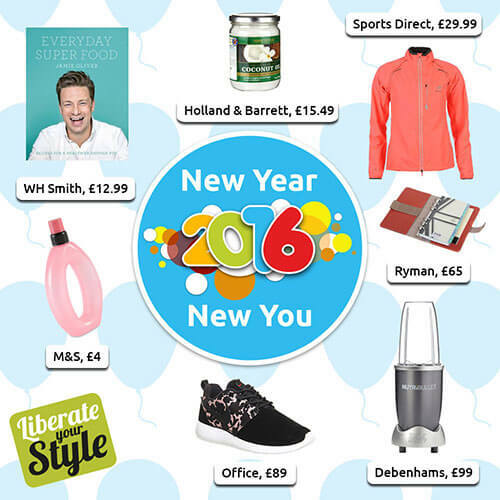 It’s 2016 and time to start the year off right by embracing small, manageable changes to your lifestyle, with a little help from The Liberty in Romford and our 100+ fantastic shops. Take a look at some of our top picks and useful tips to help support you in achieving your goals and resolutions. We’ve got everything you need to stay focused, organised and most importantly healthy…here’s to your best year yet! This Nutribullet (£99) available from Debenhams, makes getting your 5-a-day effortless and even comes with a pocket nutritionist cookbook to get you started. The blades completely eliminate pulp and can break down seeds, nuts and even ice making it perfect for creating everything from healthy smoothies to sauces and soups. Keep hydrated with this stylish running water bottle (£4) from M&S, the pink oval shape makes it ideal for when you’re on the move and your perfect partner for all kinds of sports and activities. The Liberty Top Tip: Drinking the recommended two litres of water a day may seem daunting and let’s be honest a little dull, so why not add fruit and vegetables to your bottle to add some natural flavouring? Our favourites include cucumber, lemon and raspberries. Why not give coconut oil a try for cooking and your beauty needs this year? Coconut oil (£15.49) available from Holland & Barrett, is a proven way to increase your energy levels and can also be used as a natural teeth whitener, when used to implement the ancient Ayurvedic dental technique of ‘oil pulling’ or moisturiser, keeping your skin nourished during the continuing colder weather. The Liberty Top Tip: Add half a lemon and a teaspoon of honey to some coconut oil for the ultimate skin brightening facemask or add a dab of toothpaste to a teaspoon when oil pulling to make it more palatable. Tasty and straightforward, Jamie Oliver’s latest book, ‘Everyday Super Food’ (£11.99) available from WHSmith, is great to kick start your New Year diet! Full of mouth-watering yet simple recipes, the book is split into easy to prepare breakfast, lunch and dinner recipes, making it even easier to stick to your plan. Liberty Top Tip: When cooking dinner, cook a little bit extra for lunch the next day or freeze for a quick and easy meal to prepare later in the week. By doing this, you’ll not only save time but also money and avoid any naughty lunchtime temptations. Ready to get fit but would rather get outside than down the gym? We’ve got the running jacket for you. This lightweight Karrimor Xlite jacket (£29.99) from Sports Direct, comes in three stylish colours and is designed specifically for the great outdoors with four zip pockets and reflective detailing, making it safer to run in lower lit conditions. Liberty Top Tip: Find a friend to get fit with! A running partner makes exercising that little bit more enjoyable while also spurring you on and keeping you motivated. Add a touch of style to your fitness attire with these limited edition Nike Roshe Runs (£89.99) from Office. The unique floral pattern and suede panelling will instantly add glamour to your workouts. Focus not only on a healthier body but a happier mind. Get organised with this orange leather Personal Filofax (£65.00) from Ryman. The perfect fit for your handbag, its numerous sections, dividers and pockets will ensure you’ll never miss a date again!